Plus, the brilliant postseason run of Cardale Jones and Ezekiel Elliott. Who cares if he wants to be called “12 Gauge”? Sometimes football nicknames are destiny. This week, a 6-foot-5, 250-pound former third-string quarterback named Cardale Jones was supposed to be in his Columbus meditation chamber, worrying that he was going to become Marcus Outzen or Garrett Gilbert. That is, a nonstarter who gets thrust into a college football title game and ground into dog meat. Only Jones wasn’t doing that. He was turning cartwheels while his teammate Tyvis Powell was giving a TV interview. Ladies and gentlemen, I give you Cartwheel Jones. We could bury that pun except for what Jones did in the College Football Playoff National Championship last night. Third quarter. Fourth-and-1. Jones took the snap. He had no room to run inside, so he cut left and launched his frame over Ducks defensive back Chris Seisay. “He was big,” a coach whose team had played against Jones in high school in Cleveland said last week. “Real big. HUGE … He can’t be [a] quarterback.” That big old body flipped over and gained the single yard necessary to extend the drive. Cartwheel! So it went with Marcus Mariota and Cardale Jones. Mariota was the smiling, absurdly polite Heisman winner who never did anything worse than drive 80 in a 55 mph zone. “He has become more vocal, obviously, over the years,” said his coach, Mark Helfrich. Jones was the guy who, as a freshman, sent a gloriously impolitic tweet that made him an unlikely insurgent against the NCAA. But then Jones had a baby girl, Chloe, on November 7. He was thrust into the starting lineup against Wisconsin a month later. Now, oddly, he is held up as a case study in how to live. “Of all the things that my children learn in school, I want them to read about the case study of Cardale Jones,” Urban Meyer said this week. Thus Jones was Tebowized by Tebow’s own college coach. The first quarter will go down as one of the most fun in recent history. Oregon opened the game by driving 75 yards in 2:39. From Ohio State’s 7-yard line, Mariota looked left into the end zone and saw receivers Keanon Lowe and Charles Nelson guarded by a single Buckeyes defender, Eli Apple. Lowe and Nelson were so wide open that they looked like they were playing keep-away with Apple. Lowe got the pass. 7-0, Oregon. On Jones’s second possession, he began to do weird things. He slipped away from an Oregon defender in the end zone and threw the ball out of bounds. On the next play, Jones threw a 26-yard strike to Corey Smith. His next pass went to Jalin Marshall for another 26 — Marshall took the ball off the cornerback’s back. When the Buckeyes got into fourth-and-2 at the Oregon 35, Jones flipped the ball to Marshall. The refs came out to measure it, and Oregon’s Reggie Daniels got so excited that he ran off the field in ecstatic celebration. His teammates had to grab him and bring him back. The refs said Ohio State got the first down. To that point, Oregon had held running back Ezekiel Elliott to six yards on three carries. As they say in statistics class, this would not turn out to be a representative data set. Two plays later, Elliott ran 33 yards to the house. He’d finish the night with 246 yards and four touchdowns. Elliott hadn’t had 200 rushing yards in a game until Ohio State played Wisconsin in the Big Ten championship. In his last three games, Elliott has 696 yards. Outback Bowl, 9-3, right? After the initial flurry, a pattern began to establish itself. An appropriately strange pattern. Ohio State would hand the ball to Elliott, or call on Jones to throw downfield, and it looked like we were going to get a grisly repeat of Alabama–Notre Dame 2013. But then the Buckeyes would make a mistake. Up 14-7 in the second quarter, Jones fumbled while trying to “re-handoff” the ball to Elliott after first pulling it away from him on an option. Oregon recovered. The Buckeyes stopped Oregon at the 1-yard line after Helfrich called a running play for sophomore Thomas Tyner on fourth down. Jones then threw a 47-yard strike to Corey Smith, who also fumbled. Everybody agreed that the 21-10 lead Ohio State took into halftime could have been much bigger. Winning a national title with a third-stringer will only further the divide. But for all of Meyer’s organizational wizardry, he was more interested in talking up the motivational tricks he imported from various gurus. After a summer seminar, Ohio State players wore wristbands reading “E + R = O.” (“Event plus response equals outcome,” said Jones, sounding a star trainee.) Meyer worked in a plug for a book he’d read called Lead … for God’s Sake! The author, Todd Gongwer, told me he’d written an email to Meyer before the title game in the voice of “Joe,” one of the book’s lesson-dispensing characters. 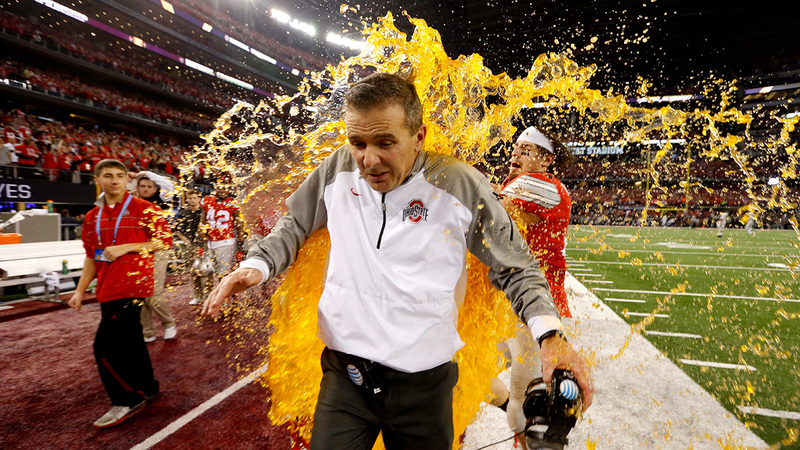 Did this stuff give Ohio State some kind of intestinal fortitude to overcome four turnovers? Did it open giant holes for Elliott’s runs on inside-zone plays? I doubt it. But when you win three national titles, every stunt seems like a stroke of genius. They all loved Mariota, Mr. Polite. And Mariota really did seem like a nice guy. It’s not his fault if he’s wielded as a weapon against Johnny Football and Jameis Winston. “We want to win it for him,” one fan said of a potential title, “as much as we want to win it for us.” How Oregon is that? “Mat drills tomorrow!” Jones jokingly yelled at his teammates when he finally got back to the locker room. It wouldn’t be the strangest thing that happened to Ohio State this year. Another Tarzan yell echoed through what Meyer called “the Jerry Jones stadium” Monday night. It was college football congratulating itself. Guess what, NFL? Now we have a playoff, too. For years, the end of the college season felt unsatisfying and almost rigged, especially to people who kept only one eye on the game. The taint is more or less gone. Two of the three first-ever playoff games were good. The third set a new D-1 record for schadenfreude. Even jilted teams like TCU didn’t undermine the integrity of the playoff so much as make it more interesting and more heated by their exclusion. A few years ago, we were asking ourselves if college football’s season was better off ending with a playoff or a giant argument. It’s now clear how wrong that was. We can have both at the same time. Other developments gave college football a new glow this year. It’s still pretty shocking that Jim Harbaugh traded his job with the 49ers for a shot at doing what Urban Meyer just did. Chip Kelly — who weathered his own back-to-college rumors — was here in North Texas, wearing that typical jealous-conspiratorial look. The NFL’s moral skid made the college game seem better, too. Not only were there Ricegate, Goodellgate, et al, but for two weeks the NFL referees couldn’t get out of their own way. None of this is to say that college football is anything other than a morally rotten business. Rather, this year college football made just enough cosmetic changes to allow sports fans to choose between morally rotten businesses. “It’s history!” crowed playoff honcho Bill Hancock, as black, gold, and white confetti fell on him at the 50-yard line. “Everybody who was here will remember this for the rest of their lives!” He may even be right. Go ahead, men. Turn a cartwheel.